Just when you were starting to think that Venice couldn’t possibly be more magical, Christmas transforms this city into a perfect winter wonderland. While cities around the world deck their streets with lights and ornaments, Venice disappears into foggy wintry sights worthy of any painting by Canaletto. 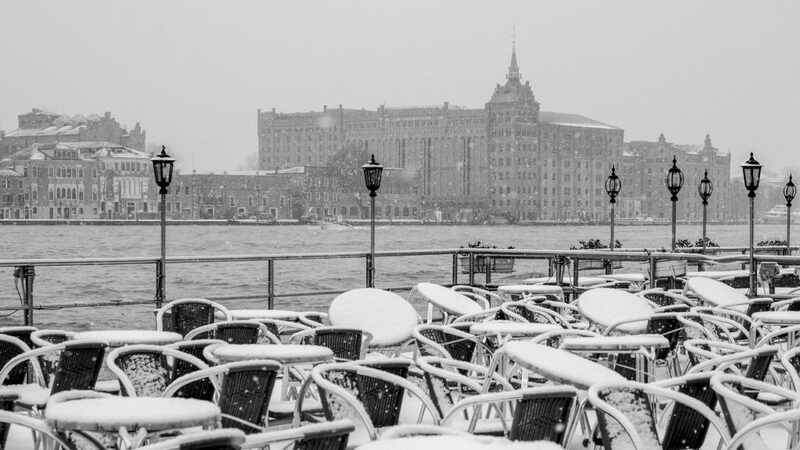 For those seeking peace and tranquility during the holidays, Venice may turn out to be the perfect venue full of concerts, hot chocolate, mysterious fog and, occasionally, snow. The month of December brings serenity and quiet to the city, due to lack of tourist crowds strolling down the streets. This is the time of year when Venice is taken over by fog and mist, turning the island into a hauntingly beautiful scene. Although Venice does not go over the top with Christmas decorations, one can still find fantasy lights and garlands adorning its main streets and gondolas. 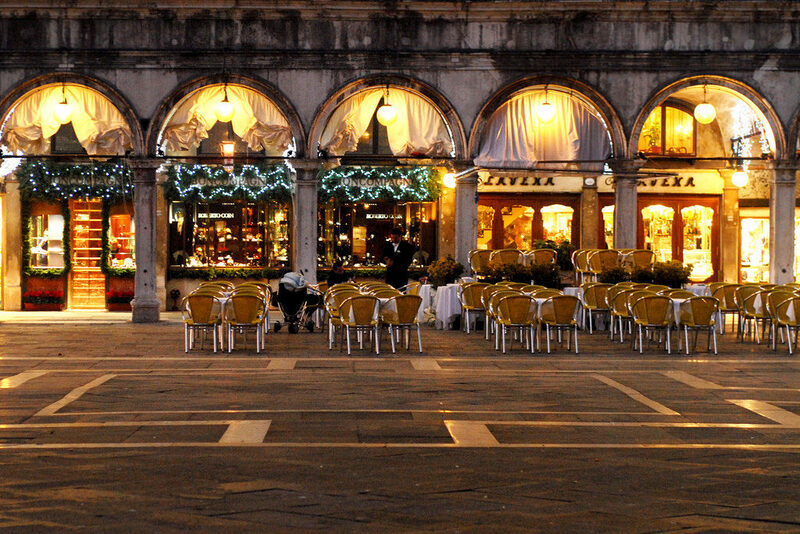 Locals take advantage of this chilly time to get together and enjoy a cup of cioccolata calda (hot chocolate) or mulled wine inside cozy bars and enotecas. Contrary to the typical hot chocolate we can taste in the United States, cioccolata calda in this region is rich and thick, often it is made by melting an actual dark chocolate bar in a cup. 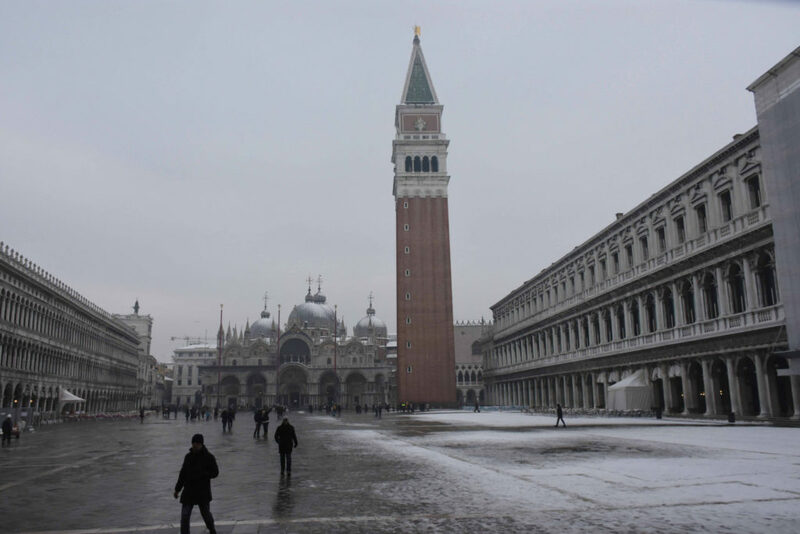 The weather is mostly humid and cold, with occasional snow and acqua alta Iflooding) in Saint Marc’s Square. It is advisable to be well prepared when it comes to choosing appropriate clothing; the wind and rain that sometimes take over the city do not make it easy for visitors to walk around. However, there is still a chance of getting lucky with sunny days every now and then. When this happens, Venetians will be more than ready to bundle up and go out for some Christmas shopping around the city. One of Venice’s most charming experiences during this season is visiting the joyful Christmas markets, or mercatini di Natale, as locals call them. 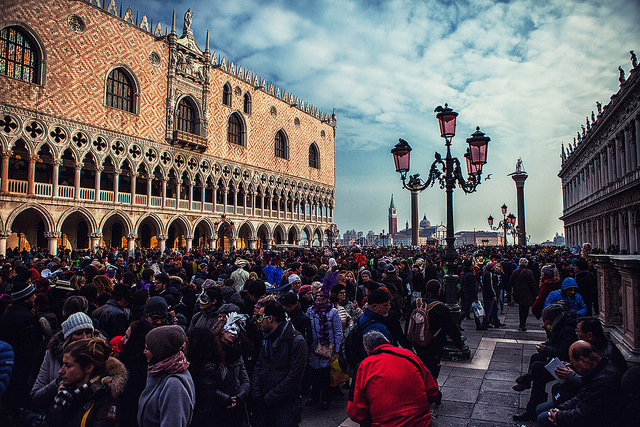 Springing up between Rialto and Saint Marc’s Square and starting from mid-December, the Venetian Christmas markets are a cheerful exhibition of Venice’s most exquisite arts and crafts. Some of these markets offer fine handcrafted articles like purses, wallets, stationery, jewelry, and christmas ornaments. Others offer fine Venetian products that range from gorgeous Murano Glass to elegant Burano lace, to hand-embroidered fabrics, to antique and vintage items. Typical food and beverages are also part of this show, sometimes accompanied by live music. It is also common to find a wide selection of Nativity scenes and objects (presepi in Italian), most of them handmade, especially near the Rialto Bridge by the church of San Giovanni Grisostomo. 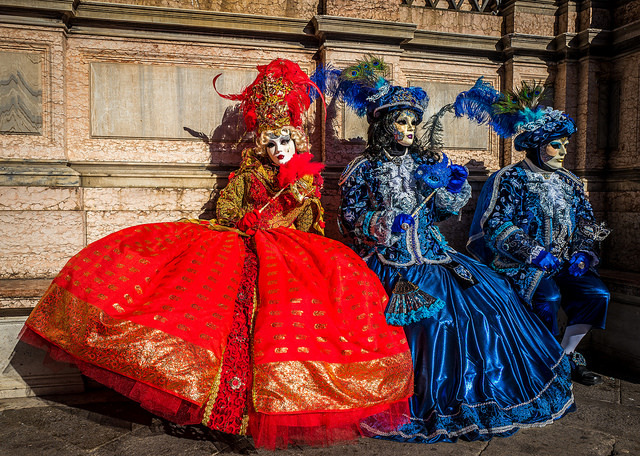 And in spite of it being Christmas-time, the Venice Carnival is never far from people’s minds, as we see colorful hand-made masks being sold at every market. 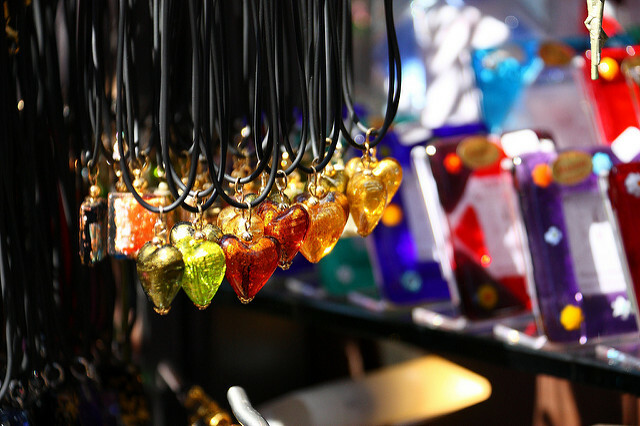 Naturally, the whole city is also adorned with countless Murano Glass decorations, and it is a great idea to visit the island of Murano for the Glass Christmas Celebration (Natale di Vetro), where visitors will be charmed by unique Christmas-themed objects made of Murano Glass. While hot chocolate may be the most familiar winter-wonderland drink to Americans, the Christmas markets offer a wide selection of traditional and tasty foods and drinks. Roast chestnuts, chocolates, candied fruit and mulled wine are just some of the yummy treats one can find while browsing the market stalls. The famous panettone, or pandoro (Christmas cake) is found in almost every Venetian home and restaurant around Christmas. The winter season also brings music and concerts. The churches and opera houses get filled with locals and tourists eager to spend the evening listening to classical music masterpieces. It is easy to find the programs by reading the posters around the city, or by visiting the year’s program online. The church of La Pietà, on Riva degli Schiavoni, usually holds some of the best concerts of Vivaldi music, who was once that church’s composer. 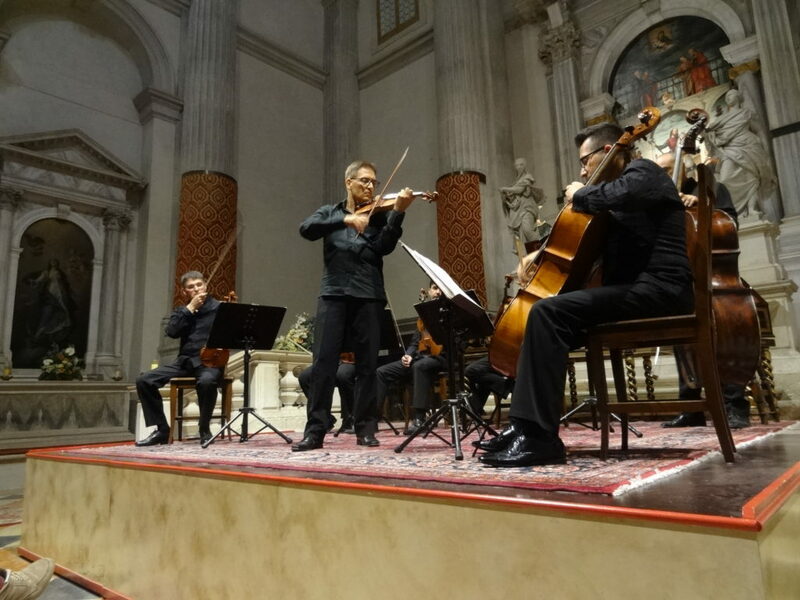 Some locations like Ca’ Rezzonico, Palazzo Moncenigo or the Scuola San Rocco hold concerts performing traditional Italian Christmas songs; while at world-famous La Fenice opera theater the winter program ranges from Mozart to Verdi offering wonderful performances. Prices and schedules always vary from place to place, some being free, some charging nominal admission, some requiring the previous booking. While walking around the city with almost no tourist crowds to obstruct the views and waiting for lines, it is also advisable to keep in mind that most tourist attractions are closed on certain days around the holidays. Museums like the Doge’s Palace, the Galleria dell’Accademia, Museo Correr and Ca’ Rezzonico close on both December 26th and January 1st. 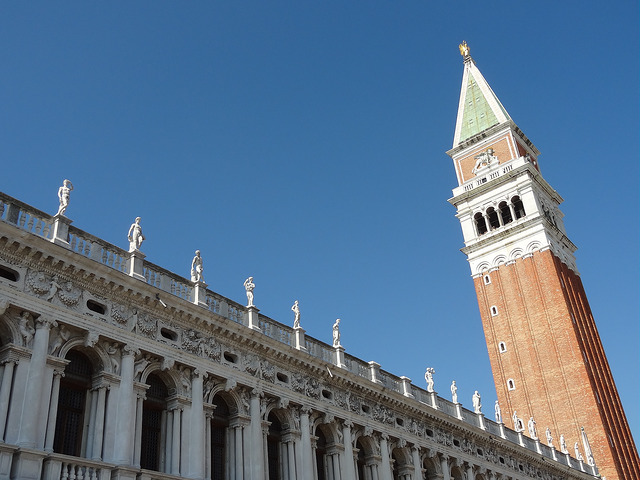 The Peggy Guggenheim Collection, however, is possibly the only museum in Venice to stay open on the New Year’s Day. Schedules for the Vaporetto (water bus) may also vary and should be taken into consideration for moving around the city. Hanukkah is also celebrated in Venice, in the part of sestiere Cannaregio known as the Ghetto – the site of the first Jewish ghetto in the world, where Judaism and Jewish traditions are kept alive and one can see beautifully illuminated menorahs, unique Murano Glass judaica, and delicious kosher food prepared for this special celebration. All these joyful celebrations and performances lead Venetians to the very much awaited Christmas Eve dinner (la vigilia). During this evening, Christmas tables all over Venice overflow with traditional Venetian Christmas Eve dishes mainly focused on fish and seafood: Venetian risotto, ravioli in capon broth, eel, mixed fried fish and an assortment of seafood with vegetables and polenta. When it comes to visitors, they should book the restaurant for Christmas Eve dinner quite early, since many of them tend to run out of seats or simply close that day. Nonetheless, many great Venetian restaurants like La Zucca, Osteria Enoteca Ai Artisti, Alle Testiere, and Trattoria La Furatola, are always open for this special evening. After the Christmas Eve dinner, many Venetians take a stroll down the streets and canals and head to Saint Mark’s Basilica to attend midnight Mass, starting at 11:30pm. The midnight Christmas mass at San Marco is a unique experience for both Venetians and tourists. This night, the Byzantine basilica is lit with hundreds of candles and incense, the famous golden Murano Glass mosaics set aglow, and the entire experience echoes the celebrations of the centuries past. 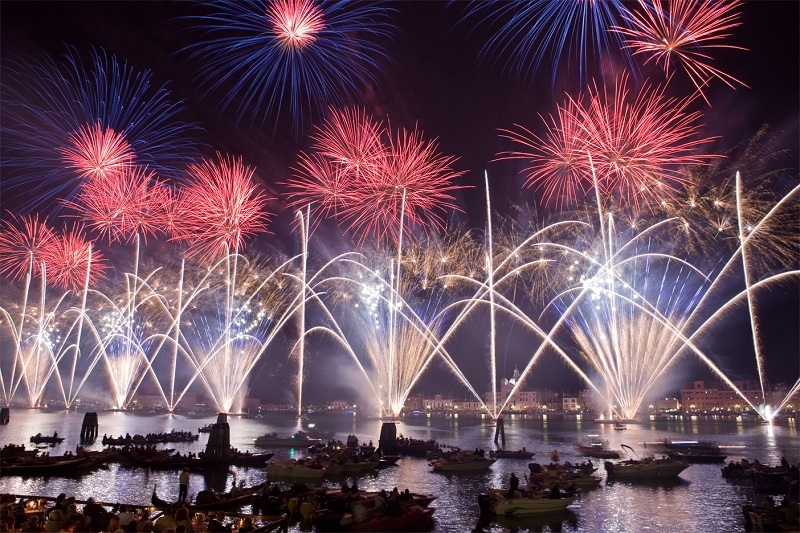 Families and visitors alike flock to San Marco for grand celebratory experience on this special night. But the celebrations don’t stop here; Italians keep on celebrating with the Feast of Santo Stefano, on December 26th, leading the way to the church of Santa Maria Gloriosa dei Frari to enjoy a free live concert and choir. Venice offers a special experience in the winter and around Christmas time, mixing peaceful beauty and the bliss of its wintry canals with ornaments and festive lights, great music, and fine food. Being there around winter holidays brings us closer to those otherworldly visions we recall from ancient paintings. This is what makes Venice possibly the most magical place in the world to spend Christmas and winter holidays. 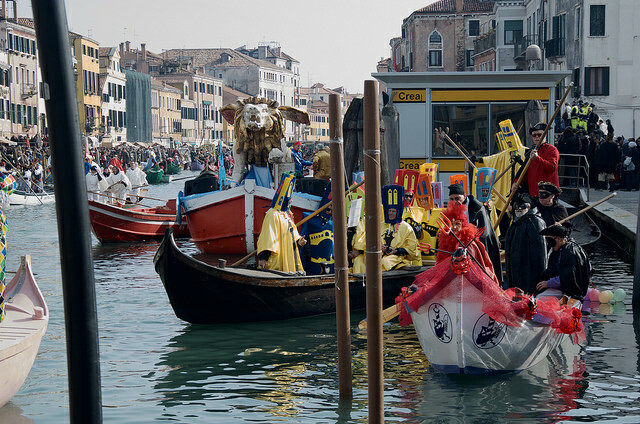 This entry was posted in Italian and Venetian Holidays & Events, Travel Tips, Venetian Traditions, Venice and tagged Venetian Traditions, Venice events, Venice Travel on January 9, 2016 by GlassOfVenice. This entry was posted in Venice and tagged History of Venice, Venetian Traditions, Venice Travel on May 5, 2015 by GlassOfVenice.